Loretta Preece has worked as a Producer, Story Producer, and Script Editor across many continuing drama series shows such as Belonging, Doctors, Casualty and The Coroner. She has been personally responsible for storylining over 2000 episodes of mainstream British television. Loretta has been Storylining Doctors since 2008 and has over 600 episodes under her belt to date. Doctors is wildly held to be one of the primary entry points into the industry for new writers and Loretta will be recreating her Writers Room to give the successful delegates the inside perspective on what new writers can expect from and what opportunities lie inside the Writers Room of this popular and enduring long running series. Six successful applicants will join Loretta in her Writers Room for the whole day on Thursday 6th September. Throughout the day, under Loretta’s leadership, the participants will work together to create a detailed 3-5 page step outline for an episode of Doctors. This will simulate a real-world experience of collaborative writing under pressurised conditions with a real deadline. Participants will be expected to come to their Writers Room having thoroughly researched the show. ** You can submit materials from a TV project of any genre but if you’re selected, be prepared to experience a MEDICAL themed Writers room. 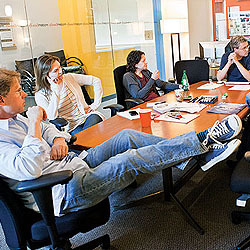 ** Please note that all Showrunners will be running their Writers Rooms as they would in real life. All participants will be expected to follow the guidelines and procedures as laid down by their Showrunner on the day. Join Director, Writer and room runner Jon Sen in this day long MEDICAL focused Writers Room experience brought to you exclusively by the LondonSWF. LSF gave me a much clearer understanding of the industry than I had before I came.